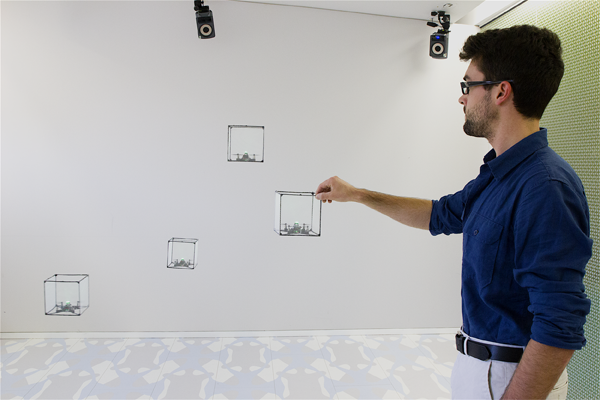 BitDrones allows users to explore virtual 3D information by interacting with physical self-levitating building blocks. It is a first step toward interactive programmable matter—materials capable of changing their 3D shape in a programmable fashion—via swarms of nano quadcopters. Researchers at the Human Media Lab created three types of BitDrones: PixelDrones are equipped with one LED and a small dot-matrix display. ShapeDrones have a lightweight mesh on a 3D-printed geometric frame and serve as building blocks for complex 3D models. And DisplayDrones lift a curved flexible high-resolution touchscreen and a forward-facing video camera. Rubens, C., Braley, S., Gomes, A., Goc, D., Zhang, X., Carrascal, J-P, and Vertegaal, R. BitDrones: Towards self-levitating programmable matter via interactive 3D quadcopter displays. Proc. of ACM UIST'15 User Interface Software and Technology Symposium. ACM Press, 2015.